Northwest Airlines and its mechanics union will resume contract talks Thursday, for the first time since the union walked out almost three weeks ago. Northwest is warning, though, that a tougher financial situation means its negotiating position will be even more harsh than when talks broke off last month. The union says it will fight to save as many jobs as possible, and will not sell out some of its most vulnerable members. St. Paul, Minn. — Talks resume Thursday at noon in Minneapolis, on the 20th day of the strike by the Aircraft Mechanics Fraternal Association. The National Mediation Board urged both sides to return to the table, and a federal mediator will oversee the negotiations. More than 4,400 active union employees, along with hundreds who were technically on furlough at Northwest, have taken up pickets rather than accept a contract proposed by the airline. Talks broke down over Northwest's plan to eliminate the jobs of about half the union members. The airline said deep cuts were needed to save $176 million a year and help stave off bankruptcy. Northwest confirmed the talks but declined further comment. The union's national contract coordinator, Jeff Mathews, says resuming negotiations is in the best interest of the public and his members. "Right now we're out on strike and our members are not receiving a paycheck. And it's absolutely worth it to go sit down at the table and see what they have to say and what they want to talk about now," says Mathews. "Our job is still to protect as many jobs as possible, and the pension, to protect that." Northwest has drawn a strong line on jobs. In a letter to the union this week, vice president of labor relations Julie Hagen Showers says the company now needs even deeper cost savings from the union. "Our last best offer which was presented to you on August 18 was based on economic circumstances that no longer exist today," said the letter. "While the company was prepared to stand behind that offer in order to obtain a consensual agreement, unfortunately we are no longer able to do so." In the letter, Showers blames a financial situation made worse by rising fuel prices. She also suggests Northwest's ability to fly through the strike puts the company in a stronger bargaining position. Showers goes on to essentially say two major categories of union jobs are gone forever. One is the aircraft cleaners, 800 of whom were on the job when the strike hit. The other group includes all Northwest mechanics stationed at U.S. airports other than the Northwest hubs of Detroit, Memphis and the Twin Cities. In both cases, Showers writes the jobs have gone to "more efficient third party vendors." If the company thought they had the complete upper hand in this, and this is going according to plan, why even bother talking to the mechanics? Union negotiator Jeff Mathews says while the union has no official response to the letter, this situation is not acceptable. "That's exactly what I'm talking about -- we're not interested in lock-stock-and-barrel getting rid of any one group or classification of employees. They're our members and it's our job to protect them to the best of our ability," says Mathews. Minnesota's top economic official is glad to see talks resume. Matt Kramer, commissioner of Employment and Economic Development, says while the economic impact of the strike on the state has been small, Northwest needs to get permanent cuts to set itself on a path to recovery. "The company has been clear that their financial picture has deteriorated since the day the strike began. Because of that, there's going to have to be more give-and-take on what it means to continue to be a viable airline," says Kramer. In her letter to the union, Northwest's vice president Julie Showers says the airline could start hiring permanent replacement workers as soon at next week. John Remington, an industrial relations professor at the University of Minnesota, says this is meant to step up pressure on the union to get back to the table. But he says it's also a signal the airline itself may be feeling pressure to get the mechanics back on the job. "If the company thought they had the complete upper hand in this, and this is going according to plan, why even bother talking to the mechanics?" Remington asks. 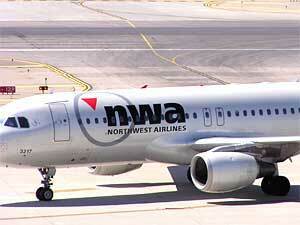 Remington says while Northwest has kept flying, the airline has good reason to put the strike behind it. "You don't want to be constantly in the position of denying accusations that service is substandard or that there are safety or mechanical problems," says Remington. "They're still in a market where poeple don't cross picket lines, and it's had to have had some impact on business. And while it may not be significant or more than anticipated, it's still reality." As the company heads back to the table, there are new signs of the mounting financial pressure on Northwest to get a concessions deal, not just with mechanics but with its other three unions as well. The airline cancelled a non-stop route from New York to Tokyo, citing rising fuel costs. And the Twin Cities airport says an expansion plan meant to accommodate growth at Northwest may be put off for at least a year.